They have a long slender body, short legs, small rounded ears and a long tail. 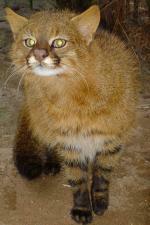 Their fur is short and sleek, and they are uniform in colour with a paler underside. They have three colour forms: Black, Brown/Grey and Red/Chestnut. The darker colours are more likely to be found in the forest regions while the lighter colours are more likely to be found in the dry regions. 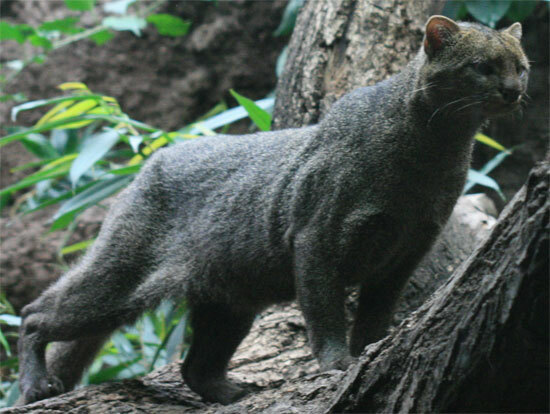 Jaguarundis live in lowland brush areas, savannah and forest regions of South USA and South America. The males have a territory of 80 - 100 Kms (45 - 56 miles) and females 15 - 20 Kms (8 - 11 miles). They are solitary animals but they are known to live in pairs if their territories overlap. They are good climbers and are comfortable in trees but they prefer to be on the ground, particularly to hunt. A Jaguarundis diet consists of fish, frogs, reptiles, birds, rodents and small mammals. After a gestation period of 70 - 75 days Jaguarundis give birth to a litter of 1 - 4 kittens. The kittens are spotted when they are born but these disappear as they get older. The kittens are weaned at about 2 months after which their mother will teach them how to hunt and fend for themselves. They will become independent at around 10 months and they will reach sexual maturity at approximately 2 - 3 years of age. Jaguarundis main predators are man and large carnivores. Jaguarundis are very good swimmers.